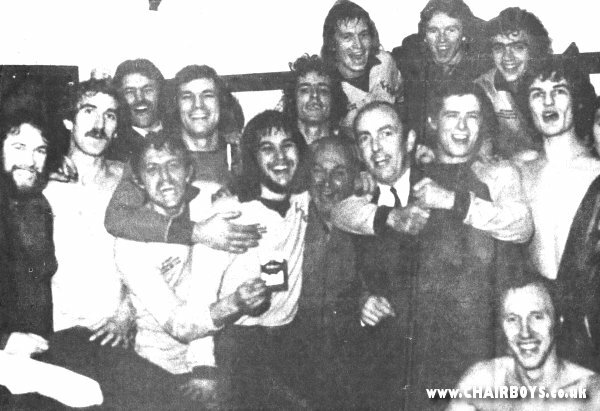 Wanderers made Club history at Dean Court on Wednesday 18th December 1974 as they beat AFC Bournemouth 2-1 to reach the Third Round Proper of the FA Cup for the first time - the reward, a home meeting with First Division Middlesbrough on Saturday 4th January 1975. The first game at Loakes Park four days previous had ended goalless, much related to the efforts of Cherries young goalkeeper Kevin Charlton. Eight coachloads of Wycombe supporters and many more by car travelled to the replay and witnessed an enthralling game in which Wanderers fought back with great spirit after going a goal down after just nine minutes. An injury to Charlton just before the break after he rushed from goal to stop a near certain effort from Micky Holifield, saw the Bournemouth goalstopper fail to emerge for the second period and replaced by outfield player John Wingate. Holifield carried on despite a later x-ray revealing he had broken his wrist. 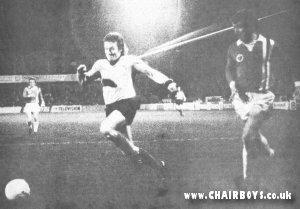 Then in a dramatic three minute spell in the closing 20 minutes of the tie, first Tony Horseman struck an equaliser, before the winner arrived on 72 minutes when a drive by Holifield took a deflection and flew into the net to send the travelling support into ecstacy. An announcement on the public address system credited the historic goal to Howard Kennedy but later inquiries revealed that the ball had hit the back of Steve Perrin before entering the net. How ever the goal came about, it was Wanderers into the Third Round and the celebrations at the final whistle were something special for those lucky enough to be there. Speaking after the tie, Wycombe Manager Brian Lee said "I thought the lads did really well in the second-half. I had to gee them up a bit at half-time and tried to enthuse them. We got off to bad start and I've seen us play better, but this was a marvellous result. The injury to Kevin Charlton must have made a difference but we needed a bit of luck in this game. We certainly didn't get it on Saturday." The Wycombe boss, who embraced his players as they left the pitch after the final whistle, added: "This is a tremendous night for amateur football. It's fantastic." Lee later went on to reveal that some of his players had not been able to get time off work on the day of the replay. "They all had a do a morning's work before we left for Bournemouth. Consequently, the day was almost a disaster. We were late leaving, late getting meals and we began the game so badly, conceeding a goal in the 9th minute, that it looked like the end of the road. It's say much for my team's fighting spirit that we fought back to win." Bournemouth boss Trevor Hartley branded his team's display as "diabolical" and added: "The greatest surprise to me is that some of the players were not ashamed of losing the game. They went out to a night club afterwards when I thought they would have wanted to hide away somewhere." Meanwhile, Wanderers skipper Alan Phillips, who was part of the Hendon side, along with Gary Hand, who had reached the Third Round with Hendon the previous season when they held First Division Newcastle to a 1-1 draw at St James's Park said: "I'm absolutely delighted. When we were 1-0 down I feared the worst, as we were playing badly. But when Bournemouth began to play the ball in the air instead of along the ground, I knew we were in with a chance. I expect this Middlesbrough game to be bigger than Newcastle, and they could be in for a surprise." Wanderers became the fifth non-League club to reach the Third Round of the FA Cup that season. Fellow Isthmian League side Leatherhead had beaten Colchester United in the Second Round and would face Brighton in the next round. Northern Premier side Altrincham would travel to Goodison Park to take on Everton. Southern League Wimbledon, with many of the Walton & Hersham side that had beaten Brighton the previous season, would travel to First Division Burnley. Stafford Rangers had a home tie with Rotherham United having beaten Halifax Town in the Second Round. Meanwhile, on the same night that Wanderers were beating Bournemouth, Third Round opponents Middlesbrough were losing 3-0 at then Second Division Manchester United in a Quarter-Final replay of the Football League Cup - a near 50,000 crowd seeing Jackie Charlton's side beaten. Boro sent assistant Manager Harold Shepherdson to spy on their Third Round opponents, while speaking of Wycombe's forthcoming opponents, Brian Lee said: We shall obviously treat Middlesbrough with the greatest respect. We should not really stand any chance against them but on our own ground you never know what the Cup throws up. Reporting for the Bucks Free Press, Stuart Earp said: A new chapter in the history Of Wycombe Wanderers was written on Wednesday night when the Blues reached the Third Round of the FA Cup for the first time in 90 years. 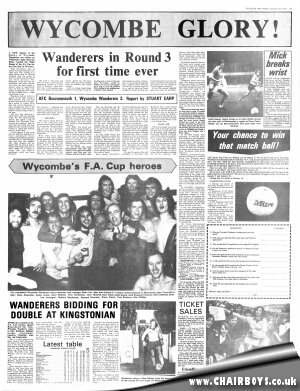 High Wycombe’s slice of history was made when the team came back after trailing to a ninth minute goal by Howard Goddard with two scores of their own inside a hectic spell of just three minutes. The Wanderers’ revival was quite unbelievable and when referee Lees blew the final whistle, a massive cheer of appreciation went up from the large contingent of supporters who made the trip to Dean Court — eight coach loads in fact. Wanderers had not only won against all the odds, facing a third division side who had already held them 0-0 in Saturday’s match at Loakes Park, they had carved themselves a place amongst the elite of the amateur soccer world who have beaten Football League clubs in the past. And how they deserved it. Many sides would have buckled under the first Bournemouth assault, that lasted a full 20 minutes. Not Wycombe. They resisted the pressure, held on until after the break and then made the most of a slice of good fortune to clinch their historic place in round three. At first glance it may seem that the half-time departure of home goalkeeper Kevin Charlton caused Bournemouth’s downfall. Not so. John Wingate, who took over the ‘keeper’s shirt when Charlton did not appear after the interval, had no chance with either goal and indeed, pulled off a couple of saves that the regular goalkeeper would have been proud of. The truth is Wycombe had their fair share of the luck they desperately needed at Loakes Park on Saturday. Little went their way in the goalless draw, but in this game. they had their full measure — although this should not detract from an excellent performance based on a marvellous team spirit and no mean skill from 12 players. This victory will go down as one of the club’s best ever results and one I shall remember for a long time. The actual football was not of Wycombe’s highest class but the sheer endeavour and emotion was unforgettable. Both sides made minor changes to their teams. Dylan Evans replacing Dave Bullock as substitute and Bournernouth bringing in Neil Merrick and Steve Buttle, witt Wingate dropping to sub. Merricks inclusion was due to an ankle ligament injury suffered on Saturday by John Delaney. who therefore missed a second chance against his old teammates. John must have watched from the sidelines with mixed feelings. Early on things looked bleak indeed for Wycombe. It was obvious Bournemouth would throw the best they had at their opponents in the first quarter and the pressure was soon paying off. Wanderers, understandably a little overawed by the different surroundings, made a string of unforced errors with Alan Phillips and Gary Hand both failing to clear dangerous situations. 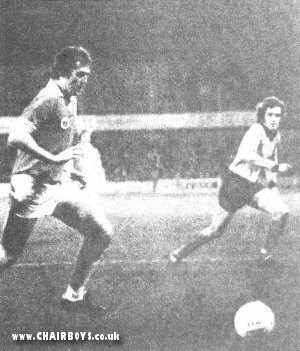 The Blues’ first attack saw Keith Searle racing through to collect Paul Birdseye’s long clearance but Merrick passed back to Charlton just in time. A minute later, however, Alan Welsh took the ball into the visitors’ penalty area and appeared to be tripped by Mick Holifield but the referee waved aside the appeals. It was Welsh who made Bournemouth’s goal after nine minutes. Once again his brilliant control took him past two defenders and into the box where he slung over a cross to the near post. Wycombe, caught by Welsh’s run, were far too stretched to stop 17 year old Goddard from running in and nodding past a helpless John Maskell. This was obviously just the start the ‘Cherries’ wanted. Using the full width of the pitch, they had Wycombe’s defence distinctly rattled and in the 14th minute Welsh again weaved his way right through the heart of the defence before crossing to Goddard. Left with ample time for the shot, Goddard fired towards the net only to see Maskell fingertip the ball away for a corner. From the flag kick Goddard had another effort blocked. At this stage there was nothing Wanderers could do but defend. Whenever they won possession Bournemouth were in with lightning speed to tackle and dispossess, then attack with interest. But in the 22nd minute Wvcombe so nearly snatched a shock equaliser. A move that must have done their confidence the world of good. Steve Perrin, Wycombe’s most dangerous striker on Saturday. ran Onto a high through ball from midfield which bounced into the box. Charlton came out to try and fist clear but Perrin managed to bundle the ball over to Searle inside the six yard box. Keith, under pressure from a defender, got a touch to the ball which rolled towards the line but Clive Payne, who saved a similar effort on the line at Loakes Park got across to thump clear again. Three minutes later Searle drove a fine effort just over the top. Those two raids put new heart into Wycombe and they began to counter-attack well at speed. They started to find themselves more time and space. although Bournemouth always looked dangerous when in possession. Holifield had to head narrowly past his own goal for a corner after 32 minutes and on more than one occasion during this spell. Wycombe were grateful for Paul Birdseye’s well timed tackles to stop Suttle on the flank. The last 10 minutes of the half belonged to Wvcombe who hauled themselves back into the game with Perrin forcing Payne to head over his own crossbar as Tony Horseman closed in. In the 38th minute Holifield again went close for the Blues. Horseman bent a pass around Merrick to Holifield who took the ball into the box and forced Charlton to dive at his feet to save. This caused the ‘keeper’s shoulder injury although he continued after treatment and made a diving save from Perrin’s cross a few minutes later. Brian Greenhaigh went close with a lob at the other end but the, final move of the half went to Wycombe with Reardon, Perrin and Holifield combining well with the latter just unable to get in a shot when well placed. So, despite trailing by that early goal. Wanderers must still have held high hopes for the second half. What they really needed was some more invention from midfield. The Blues’ trio worked hard but in case of errors, did not produce anything out of the ordinary. The defence, after their shaky start, had performed well with Keith Mead immaculate, while the front runners had done all that was expected of them. Wycombe’s hopes for the new half must have soared even further when they saw Wingate, normally a striker and without any first team goalkeeping experience, coming out to play between the posts. Charlton had damaged a shoulder and could not play a further part in the match. Wanderers’ tactics were now plain. They had to put as much pressure as possible on Wingate to attempt to exploit errors and after Gary Hand had gone into the referee’s book for a dangerous tackle on Greenhaigh, they forced two successive corners. Wingate did well to deal with both of these. 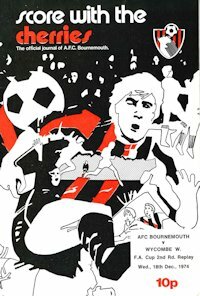 Bournemouth retaliated with Howard firing too high and Greenhaigh heading straight at Maskell from five yards following a run and cross from Keith Miller. That was the final home attack for some time to come. Wycombe now seized the initiative completely and mounted a string of attacks on the home goal. Holifield raced through and forced a corner and then the same player almost levelled the scores in the 68th minute. Perrin beat Les Parodi on the flank and cut into the box to the bye-line. His cross was cleared as far as Holifield who forced a great save from Wingate with a fierce volley. In the 69th minute Tony Horseman, so often the club’s hero in the past, put Wanderers on level terms with a brilliant individual goal. Receiving the ball from’ Reardon, “Bodger” slipped his defender perfectly. ran on and then gave Wingate no chance with a sweetly struck drive. Wanderers could hardly believe it. With the crowd still buzzing. Kennedy rammed in a powerful effort that Wingate again smothered well and then, just three minutes after that equaliser, the Blues went ahead for the first time. Holifield. picking up possession just inside the Bournemouth half, ran 35 yards towards the penalty area before unleashing a shot. There’s not much doubt it was going wide until it struck Steve Perrin in the face. Wingate, diving left to cover the original shot, could only watch as Steve’s deflection took it to the right and into the net. So incredibly, Wanderers were 2-1 up away to Third Division Bournemouth. It was at this stage they showed some remarkable coolness in a difficult situation. They played the ball around well, denying the home side much needed possession and instead of thumping their clearances anywhere, they played the ball to the man. It was now Bournemouth’s turn to be rattled and they gave away several free kicks, playing right into Wycombe’s hands. In the 18 minutes remaining, Maskell came out well to cut out a couple of crosses while Dylan Evans replaced Horseman with 11 minutes left. The closest Bournemouth came to an equaliser was after 82 minutes when Greenhaigh dribbled into the area and won a corner but Maskell’s punch clear almost set up an attack at the other end through Reardon and Evans. In those dying seconds it became clear Wycombe had done enough for victory and the final whistle was greeted by a tremendous cheer front the Blues’ followers. 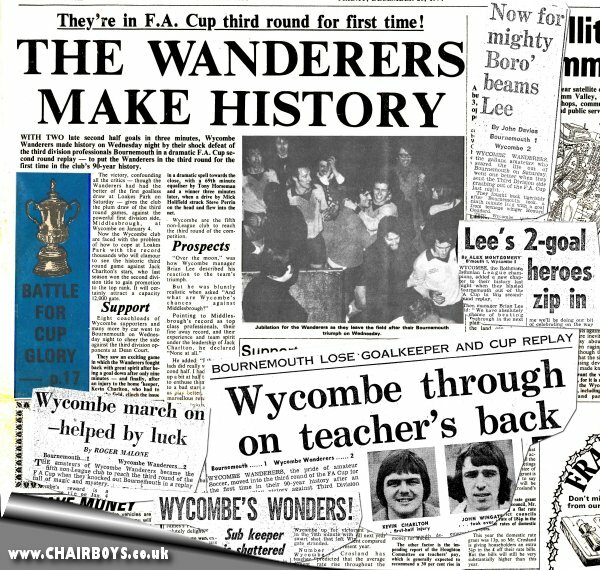 Manager Brian Lee and his assistant John Reardon raced onto the field to embrace their players, 12 tired men who had just fulfilled an ambition Wycombe Wanderers had waited 90 years to achieve. Reporting for the Bournemouth Echo, Colin Smith said: There was no disputing [Wycombe's] right to stage that Middlesbrough match on January 4. Bournemouth failed utterly to heed the warning which was sounded on Saturday at High Wycombe, where they were lucky to survive and have a second chance. Reporting for the The Daily Mail, John Parsons said: Wycombe Wanderers, the pride of amateur Soccer, moved into the third round of the FA Cup for the first time in their 90-year history after an astonishing replay victory against Third Division Bournemouth. The fact that both Wycombe goals were scored in the second-half when Bournemouth had substitute striker John Wingate in goal for the injured Kevin Charlton only partly explains the triumph. A goal down after nine minutes, Wycombe fought back with far more zest, boldness and initiative than many a Third Division side visiting this ground, and in the end won on merit.